Nearly all Chileans live in cities. The typical Chilean city has traditional-style, adobe buildings and quaint plazas in the older sections. Modern-style offices and other buildings are scattered along major streets. The tallest buildings hardly reach four or five stories in most cities. The suburbs range from hastily built callampa (mushroom in Chilean speech) settlements to fine modern homes that have well-kept flower and shrub gardens. Many of the callampa began as unplanned shantytowns, built by poor rural families moving to the city seeking jobs. The families could not afford high city rents, so they ended up living on the edge of the city. They built temporary homes from scrap lumber and cardboard. The government has made most of these settlements permanent by providing them with at least some public housing, mail service, schools, running water, and electricity. Yet many inhabitants of callampas are unskilled, undereducated, and unemployed. As Santiago has grown, urban planners have built modern skyscrapers in the downtown center. The downtown is now a place of steel, glass, neon, and modem shopping malls and movie theaters. These same modern elements appear at major intersections along boulevards (Allende’s octopus tentacles) that radiate from downtown. Like all large cities, Metropolitan Santiago has a fast-paced lifestyle. Three subway lines connect the downtown to sedate suburbs (barrios). Chile’s urban society can be divided into three income groups: very rich, middle class, and poor. The very rich live in suburban mansions in the foothills of the Andes. The group includes the wealthiest 20 percent of the country’s households. These families control about 40 percent of the nation’s annual income. This is a big improvement since the 1950s, when 20 percent of the country’s households controlled about 80 percent of the nation’s annual income. Additionally, per capita income (the average income per person) has been rising since the 1990s. This trend has led to a rapid growth in the size of the middle class. The expanding economy has allowed more and more poor people to find better paying jobs. In 1987, people living in poverty made up 40 percent of the total population. By 1998, the poverty level had decreased to 22 percent. Nevertheless, there is room for more improvement. Chile ranked a distant second behind Uruguay for the lowest poverty level in South America. (Uruguay’s poor made up only 6 percent of the total population in 1998.) A nagging unemployment rate is too high, hovering between 9 and 10 percent during recent years. Most of the unemployed live in crowded shantytowns, and the poorest of the poor still live in rural areas. Population geographers expect the rural poor to continue moving into cities with the hope of finding jobs. The inflow of people will continue to increase demands on an alreadystrained urban environment. Santiaguinos [residents of Metropolitan Santiago] have become accustomed to following the daily smog index just as faithfully as they keep track of the stock market or the soccer results. The level of grime, noise, overcrowding, and traffic jams in Chile’s cities is depressing. Metropolitan Santiago, which includes half of the nation’s urban population, has one of the world’s most serious air pollution problems. Each winter, cold, dense air from the Andes sinks into the city’s valley. Warmer air aloft acts like a cap and traps pollutants in the cold air. With no place to go, Santiago’s smoke, gasoline fames, dust, and diesel soot build up in the cold air and turn it into a coppery haze (smog). As in the world’s other cities that have major smog problems, there are days when the haze sickens and even kills babies in their cradles, old people in nursing homes, and birds in the air. A big part of the air pollution problem is that Chileans drive too many cars. 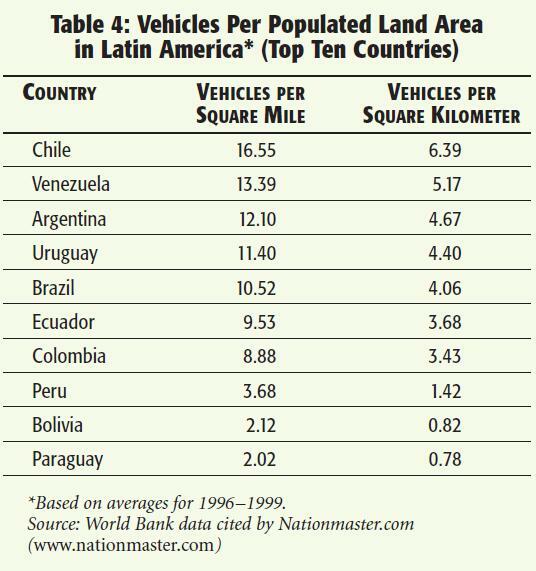 They drive more cars per populated land area than any other Latin American country (Table 4). In the struggle to stem air pollution, Chile’s government requires that gasoline stations only pump lead-free fuel into cars. The government also requires that all Metropolitan Santiago vehicles built after 1992 must have catalytic converters that remove harmful pollutants from a car’s exhaust and has set limits on gaseous emission from factories. The air is so awful that the city assigns days that vehicles can be driven based on their license plate number. A toll on cars entering the central city may be next, as more of the city’s poor move into the middle class and behind the wheels of their own cars. Metropolitan Santiago is not the only urban area with environmental woes. Water pollution is a widespread concern. The problem is most acute in shantytowns. Neighborhood councils ask people not to throw garbage or dump human waste into open drains and ditches, but people too poor to afford sewer connections have no choice. Large companies that are seeking to maximize profits are also guilty. The fishmeal industry is especially culpable. Rather than paying the expense of treating waste products, fish processing plants discharge entrails of fish into the ocean. Seawater is so polluted that authorities periodically have to close beaches near Talcahuano. The open-air plaza (town square), one of the basic elements of Chile’s towns and cities, provides an escape from the pollution and daily turmoil of city life. The plaza is a transplant from Spain: Spanish colonists tried to recreate Spain’s towns and cities in the New World. The Spaniards also included in their towns an orderly, rectangular grid of streets that enter plazas from all sides. Plazas are beehives of social activity, because they are built in central locations. They are perfect places for townsfolk to meet and reminisce, gossip, discuss issues, or just to relax together. Private and public activities, such as parades, religious processions, weddings, speeches, and festivals, also take place in plazas. In the distant past, local authorities also used the plaza for public floggings and hangings. Small towns have a single square plaza in their center. Large towns usually have one central or main plaza and several smaller or neighborhood plazas. Flower gardens and trees adorn most plazas. Typically, the squares have a water fountain or a statue of an important person who is associated with the town or nation. Spanish colonial law dictated that town plazas include a fort, church, jail, and cabildo (town hall). Each structure occupied a different side of the square. Most plazas have undergone changes, but their basic function as a meeting place for people is still very important today. The most famous plaza in Chile is Plaza de Armas in Santiago’s original center. Pedro de Valdivia originally laid out the town in 1541. The weapons (artnas) he stored in the central plaza’s fort are the basis of its name. In the larger cities, there have been important changes in the classic Spanish street grid pattern. Diagonal, tree-lined boulevards interrupt the old right-angle pattern. City planners built these wide thoroughfares for rapid access to the city center from the suburbs. In Santiago, planners have also added subways to the classic pattern. Commercial activities that used to be prominent in plaza areas are now dispersed along the new routes. A hodgepodge of tall office buildings and modern apartments are replacing family homes along these routes. If Marco Polo had descended on our coasts after thirty years of adventuring through Asia, the first thing he would have been told is that our empatiadas are much more delicious than anything in the cuisine of the Celestial Empire (China). Chileans prefer to eat traditional dishes (although many of these now come in frozen packages). The empanada is a popular turnover-type snack. It can be deep-fried or baked. It is made with a variety of fillings, including mince, chopped egg and olives, cheese, or even fruit. The empanada is popular in other parts of Latin America, but the onion-filled version is typically Chilean. The poor, who could not afford meat, originally ate it. Humitas and pastel de choclo are corn-based dishes. There are a variety of potato-based breads. Black beans cooked with corn and noodles are another popular dish. Chile is not ideal vegetarian territory, because Chileans prefer to have meat as the main dish in a meal. The standard feast is a heart specialist’s nightmare: a barbequed slab of beef topped with two fried eggs and buried in chips. The favorite restaurant among Chileans is the parillada. It specializes in a wide range of barbequed meat dishes. The most popular are beefsteaks, sausages, lamb chops, and pork chops. A topping of grilled udder parts and animal intestines is common. Seafood, which is more wholesome, is caught in the cold Antarctic and Humboldt currents and is the bases of popular dishes as well. Before the early 1980s, the scent of fresh bread waited through every neighborhood. The baker would hang a white cloth on a pole outside the door of the panaderia (bakery shop) to tell townspeople that the next batch of warm bread was out of the oven. Each day, the father of the family assigned someone the task of walking to the corner shop to buy the fresh bread. Trips to neighborhood markets for fresh meat, fish, and vegetables were also a part of the daily routine. Now, nearly 90 percent of retail food sales take place in large shopping centers. Newer supermarkets often include bakeries, flower shops, extensive wine sections, and large dairy, meat, fish, and fresh produce departments. Meanwhile, new “hypermarkets” offer these products, as well as nonfood products and services. The larger food markets also stay open much longer than the neighborhood grocery store; some remain open nearly 24 hours, including weekends and holidays. Nevertheless, traditions seldom die away totally; in countless small towns, mom-and-pop grocery stores survive and white cloths still flutter in the breeze outside neighborhood panaderías. Chilean families still try to eat meals together. Meals are seen as opportunities to share important moments with family and friends. Lunch and dinner can last from 45 minutes to two hours. Even so, like the decline in neighborhood panaderías, the tradition of the family having daily meals together is weakening. There appear to be five factors behind this trend. First, fastfood franchises, which make it easier to have a quick meal, are multiplying. Second, more women are entering the workforce, so they have less time to prepare traditional meals. Third, there is a mounting acceptance of American foods, which makes fast foods more acceptable. Fourth, as cities grow, places of employment spread out spatially. Thus, family members who work are less able to come home in time for meals. Finally, most family members can fix their own meals, because frozen foods can be prepared in a microwave oven in a matter of minutes. Eating at home therefore does not require several family members be there to help prepare or cleanup after meals. The changing shopping patterns, attitudes, preferences, and technologies involving food are a reflection of the fast-pace of an urban, middle-class lifestyle. The changes are suggestive of the modern urban culture everywhere, for better or worse. Chile also has modern health and educational facilities. Compared to citizens of other Latin American nations, Chileans have one of the highest life expectancies at birth, about 76 years. Chile’s infant mortality rate is one of the lowest, at just over 9 deaths per 1,000 live births. These impressive numbers reflect Chile’s excellent national heath care system. Access to the system is free of charge in case of indigents and those whose incomes fall below a certain level; 64 percent of Chileans receive help from the national heath care system. Virtually all remaining citizens have private health care insurance. Except for the urban poor, most Chileans enjoy effective health care. Recent government programs have placed an emphasis on innovative programs. One program focuses on infant care and school lunches. An antismoking program concentrates on educating young people about the dangers of tobacco. The government also places high taxes on tobacco products to discourage smoking. In Chile, as in other industrialized nations, the major killers are cancer and heart disease; both diseases are related to tobacco usage. Deadly car accidents that are related to alcoholism are also of growing concern. Most Chileans are interested in improving their mental and physical health. In recent years, exercise gyms have become popular among Chile’s growing middle class. Chilean gyms follow the U.S. and European gym format, which offers a wide range of services. Exercise machines, professional instructors, swimming pools, saunas, spas, and even coffee bars for mental as well as physical relaxation are part of the offerings. Chile’s educational system is widely regarded as being one of Latin America’s finest. Preschooling is open to children five years of age or younger. Basic education is compulsory for children ages 6 to 13. Secondary education lasts four years but is not compulsory. It includes students who are 13 to 17 years old. Adult education provides basic and secondary education for people who dropped out of regular schooling but wish to continue their education. The top universities include the University of Chile, the University of Concepción, the Catholic University of Chile, and the Catholic University of Valparaiso. Foreign educators recognize Chilean higher education as being among the best in Latin America. A few thousand Chileans study abroad, about one-fifth of them in the United States. The most popular careers among college graduates are teaching, medicine, engineering, and computer technology. Chile is the most “wired” country in Latin America. The country has more Internet users (200 per 1,000 people in 2002) than any other Latin American country. (The United States has about three times as many users—591 per 1,000 people in 2002). Internet cafés are available, even in small towns, for those people who do not own a computer at home. The situation will improve because the government has recently reduced the cost of telephone service. In 2003, the government was in the process of providing high-speed connection services in Iquique, Antofagasta, Valparaíso, Concepción, and Santiago. Like citizens in any modern democratic nation, Chileans have a wide range of newspapers, magazines, and electronic media to learn about what is happening at home and abroad. They are avid readers of newspapers, perhaps more so than people in the United States. There are about 30 national newspapers. The most read newspaper is El Mercurio, published in Santiago. The journalistic quality of this 50-page daily paper is comparable to the Times of London, the New York Times, or the Chicago Tribune. The large German-Chilean community reads the German-language publication El Condor, which is published once a week and is read regularly by 15,000 to 20,000 Chileans. The best source of Chilean news in the English language is the capital city’s Santiago Times. All regional capitals have their own major newspapers. Magazines are equally numerous. The most popular weekly news magazines are Que Pasa and Ercilla. They are similar to Time and Newsweek, in that they cover a wide range of national and international topics. Casas (Homes) is Chile’s Good Housekeeping magazine. Its Sports Illustrated is El Grdfico (The Graphic). Castillo-Feliau (author of Culture and Customs of Chile) believes that Condorito (Little Condor) is the quintessential Chilean magazine. Newsstands have sold it since 1945. The main character is an Andean condor that “is to Chile what the bald eagle is to Mexico and the United States.” Castillo-Feliau describes Condorito as having human traits, “much like Walt Disney’s Mickey Mouse, Donald Duck, and Goofy.” Aside from his bird’s head and beak, Condorito is human. He changes his character but never his Chilean personality; he can be “a bum, a salesman, a policeman, a physician—in short, he can assume any role or profession that exists in Chile.” Castillo-Felix believed that the success of this magazine “lies in the way its creator can depict Chilean reality at an apparently comedic level, in much the same way the All in the Family and I Love Lucy did in the U.S. television from the 1950s though the 1970s.” Yahoo, Inc. maintains a web page that describes, in Spanish, Condorito’s group of characters. The site also provides recent excerpts from the magazine. Chileans live in some very far-flung places, ranging from the windblown canyons in the north to icy coastal fjords in the south. Modern radio and television connect all but the country’s poorest and most remote people to the outside world. The technology and service in Chile is virtually identical to that in the United States. The only difference is that their availability came a few years later in most cases. Radio dates back to the 1920s and television to 1959. There are 18 radio stations in the country. Programming includes Chilean folk music, classical music, and popular music, including foreign performers such as Madonna, Spice Girls, Bob Dylan, the Rolling Stones, the Beatles, and The Doors. There are five television channels in Chile. Television entertainment took on a decidedly international flavor in 1986, when satellite transmission began. In addition to domestic channels, Chileans have cable, which gives them access to providers worldwide. Cable channels include CBS Telenoticias, TNT, HBO Ole, Discovery, Discovery Kids, Warner, Fox, ESPN, Sony Entertainment, MTV, Cartoon Network and others from the United States. Spanish is dubbed in nearly all TV (and cinema) movies; subtitles showing the original English script are rarely included. CNN is received in both English and Spanish. Other TV channels come in German, Italian, and other languages. Around the house, watching TV is the main leisure activity. Telenovelas (soap operas) produced in Chile, Mexico, Brazil, Argentina, and Columbia are popular. Seventy percent of Chileans follow the national soaps on a daily basis. Unfortunately, this kind of activity contributes to obesity. As they are doing in all modern countries, medical doctors in Chile are pointing to too much TV watching as a main cause of the problem. Health officials everywhere agree that solving the obesity problem requires regular exercise and healthy eating habits. Fortunately, Chileans are not total “couch potatoes.” Taking time off and visiting the countryside are important family traditions. Chile is a small country, so getaway locations are always nearby. The ocean’s surge calls many families to the sea. Chile’s excellent highways provide access to fashionable seaside resorts in less than two hours. Day-trippers and weekend vacationers arrive by private car or public bus. Popular resorts include Concon, Vifia del Mar, San Antonio, Zapallar, and Cartagena. Body surfing, boogie boarding, surfboarding, windsurfing, sailing, and sea kayaking are popular activities. Equally as popular are trips to the north end region of southern Chile to spend a day or two on a lakeside beach. Glacial lakes and nearby freshwater streams offer excellent trout fishing. The trout are sweet, plump, and delicious drawing anglers from all over the world. Skiing is also popular among Chile’s middle and wealthy classes. Ski resorts in the Andes stretch from just north of Santiago all the way to Patagonia. The most famous ski resort is Portillo. It is a short trip for many Chileans, because it is only about 90 miles (145 kilometers) east of Metropolitan Santiago. Besides Chilean urbanites, Portillo attracts skiers from countries in the Northern Hemisphere. Foreign skiers are able to begin their ski season early, because Portillo’s season runs from the middle of June until the middle of October. In addition to skiing, the Andes offer hiking, camping, snowboarding, and mountain biking. Chileans from all backgrounds enjoy watching horseracing, equestrian (horsemanship) competitions, and tennis. Soccer (futbol in Spanish) is Chile’s main spectator sport. Thousands of Chileans watch professional teams in large stadiums in the country’s principal cities. Soccer is not just watched, however. Chileans play it with passion at all ages. Children often begin playing the game at a very young age, sometimes as soon as they are able to walk. It is common to see an entire Chilean family—preteens, teens, fathers, mothers, and even grandparents—enjoying a backyard soccer game on weekends or during holidays. Chile uses the metric, rather than English, system of weights and measures. Grams and kilograms, not ounces and pounds, appear on packages. Meters and kilometers, not feet and miles, designate distances. Hectares, not acres, reference areas. Chile is four hours behind Greenwich Mean Time (or universal time coordinates). If it is 3:00 P.M. in Santiago, it will be 7:00 P.M. in Greenwich, England. The country does not observe daylight savings time. In other words, Chileans do not turn their clocks ahead an hour in the spring (“spring forward”) and back an hour in the fall (“fall back”) in order to have an extra hour of daylight during the summer. Chileans observe several public holidays when most shops, offices, and museums close. They take time off to celebrate New Year’s Day along with the rest of the world on January 1. They observe Good Friday and Easter in March or April, but the exact dates vary. Other public holidays are Labor Day (May 1) and Naval Victory Day (May 21), which commemorates a naval battle between Chile and Peru during the War of the Pacific. Additional national holidays are Saint Peter and Saint Paul’s Day (June 29), Assumption of the Virgin (August 15), National Independence Day (September 18), Armed Forces Day (September 19), All Saints’ Day (November 1), Immaculate Conception Day (December 8), and Christmas Day (December 25).